Aaaaaaaah, best intentions. Sometimes they just don't work out the way we planned. You may remember back in November when I kicked-off the Twelve Weeks of Winter Squash with this Sesame and Chile Roasted Butternut Squash. I was excited for another year of delving deeper into the world of winter squash. I was determined to find new ways to use them, and to use the ones I use less often. Alas, I did really well for the first six weeks—and then I dropped the ball. Life started moving at a dizzying pace, the end of the year was upon us (which I know is supposed to be a joyous time, but for me, it's always the most stressful). Winter squash sat on my counter, neglected. I kept thinking I'd get to a recipe later, and squeak in towards the end of the week. Before I knew it, it was the next week, and I'd be saying the same thing. I did manage to complete one winter squash recipe in the final six weeks. Lame. A few of my winter squash compatriots actually did manage to delve deeper, and post all twelve weeks, though—to them I take my hat off. So today, I'm sharing a simple one-pan recipe featuring Acorn squash, but I'm also sharing the entire list of recipes made by the Twelve Weeks of Winter Squash group throughout our event this year. If all goes as planned, I will try to meet my goal of exploring new varieties and cooking methods for winter squash again next November. Until then, here's to winter squash....and best intentions! 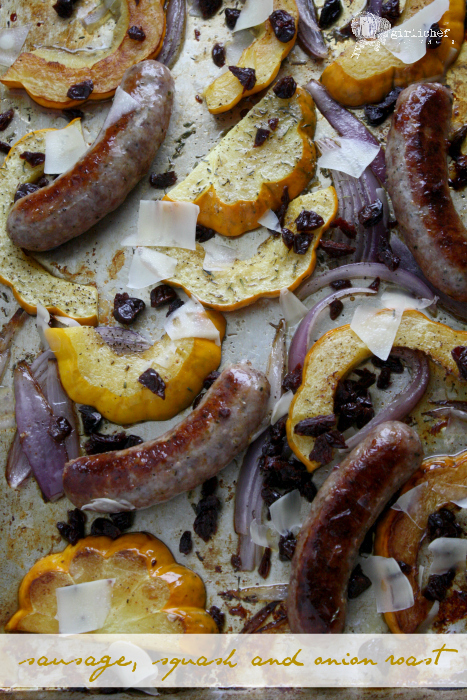 A simple, roasted one-pan meal featuring sweet Italian sausage, acorn squash, red onion, dried cherries, and herbs. Preheat oven to 425° F. Cut the squash in half from tip to tail, then remove the seeds. Slice into 1/2-inch thick half moons. Cut the onion into 1/4-inch thick wedges. Toss the squash and onion with the olive oil and sprinkle with the thyme, fennel, and a good smattering of salt and pepper. Lay on a rimmed baking sheet, then add the sausages. Slide into the oven and roast for 18 minutes, or until the veggies are golden and tender, and the sausages are cooked through. Remove from oven and scatter the chopped dried cherries over the top, and shave a bit of Parmesan over everything, if using. Curried Butternut Squash Bisque with Cashew Cream (vegan) from Healthy.Delicious. 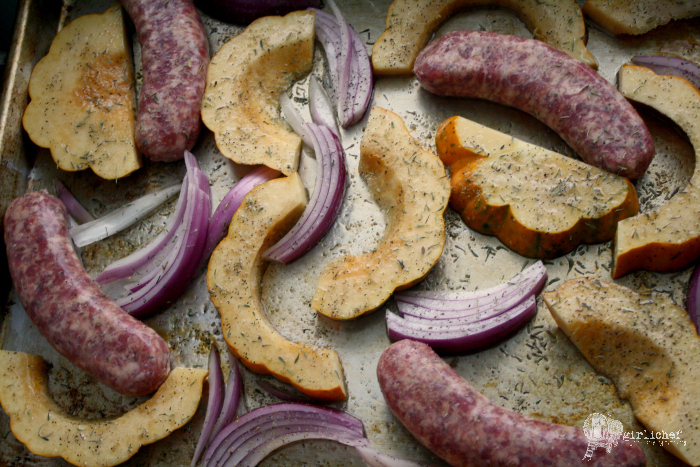 Follow my Squash(in') Winter Pinterest board for more great winter squash recipes.